This recipe was inspired by a delicious stew, “asopao con camarones”, that we had many years ago at a Taino Restaurant in Puerto Rico. Pictured with an arugula, carrot and tomato salad dressed in a simple vinaigrette and plantain chips on the side. Peal, de-vein and set aside shrimp. 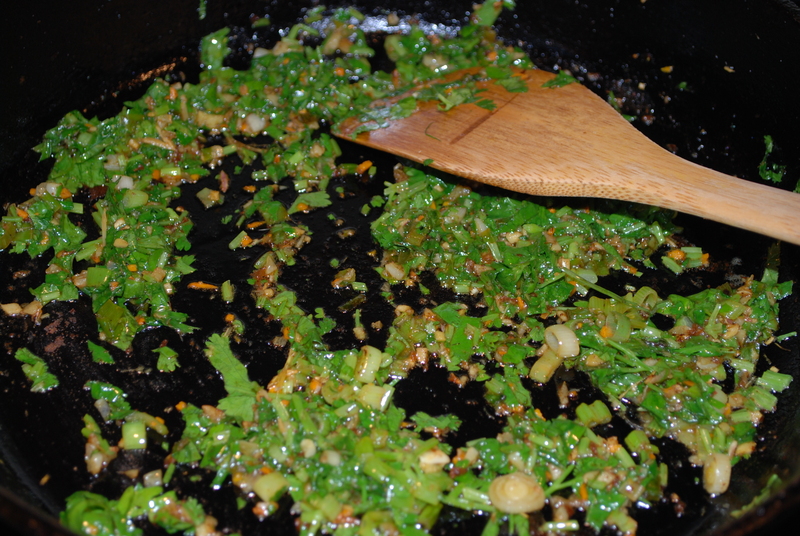 In a large pot over low heat sauté the recaito (OR modification -onion, pepper, cilantro and garlic) in olive oil for 10 minutes, stirring occasionally. 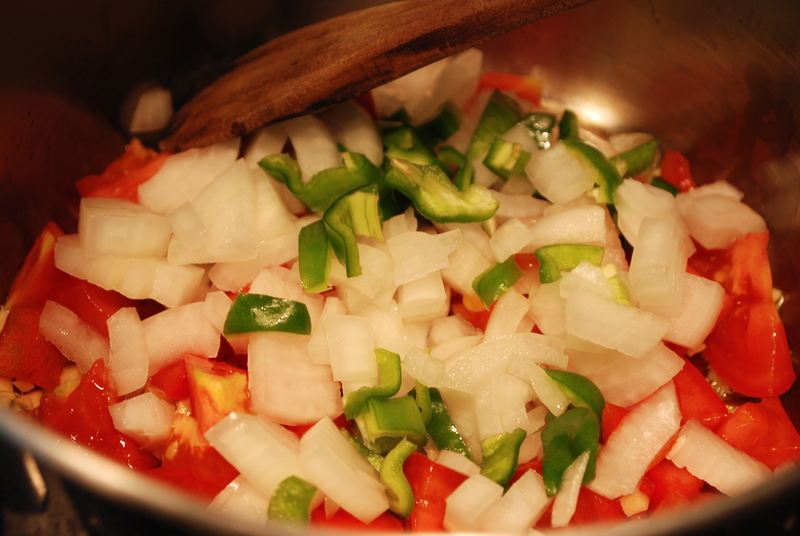 Add spices and tomato sauce, stir, bring to simmering and allow to simmer for 5 minutes. Add water and bring to a boil. Add the shrimp, return to a boil and cook for 10 minutes. If serving this in the traditional style, over rice- start the meal by cooking the rice so it is done once this quick stew is prepared. 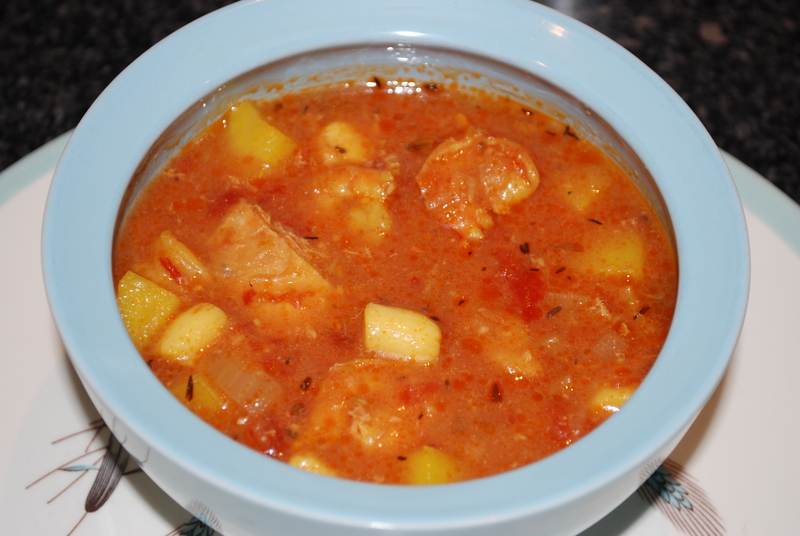 This entry was posted in in the home and tagged asopao, camarones, puerto rican, recaito, recipe, shrimp, soup, stew on November 13, 2014 by lenapietri. I served the seared coconut shrimp with fresh ginger, turmeric and lemongrass over brown rice with a spinach salad and balsamic vinaigrette on the side. Peel shrimp and set aside in a bowl. 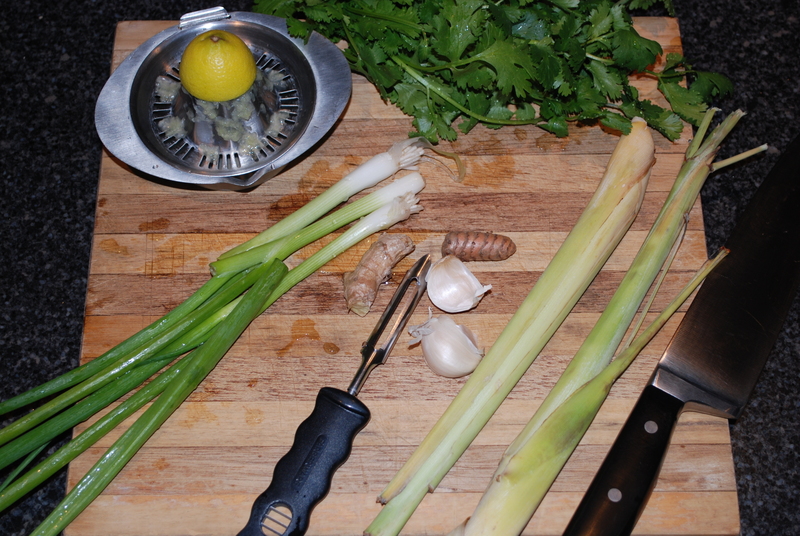 Prepare scallions, garlic, turmeric, ginger and lemongrass (how to prepare lemongrass in a video from the NYTimes) and place in separate a bowl. Press lime juice and set aside. Prepare cilantro and place in another bowl. Preheat a large cast iron (or other nonstick heavy bottom pan) over medium high heat. Add coconut oil. Place shrimp in pan one at a time, don’t crowd them. When the tails start to turn orange and the edges are cooked lift to check and flip with crispy. Cook until crispy on the reverse side. 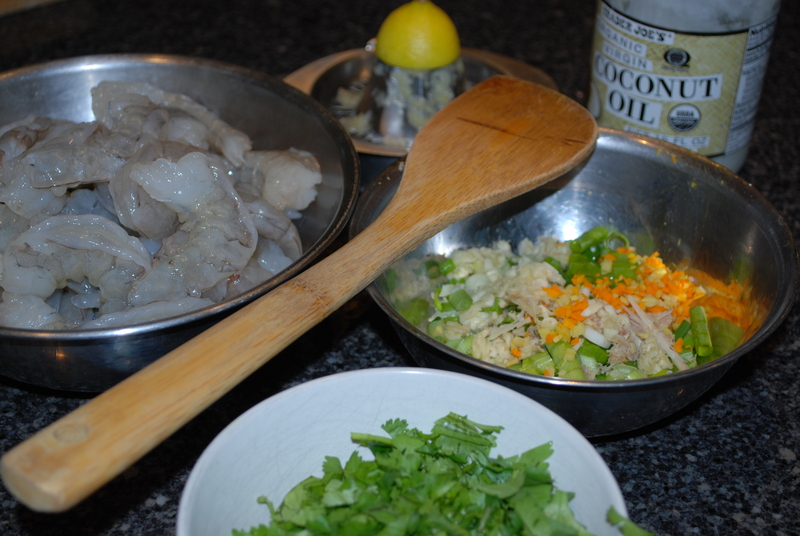 Remove the shrimp from the cooking pan and place in a shallow dish or bowl. Add more oil as needed. Repeat and continue cooking until all of the shrimp is cooked. 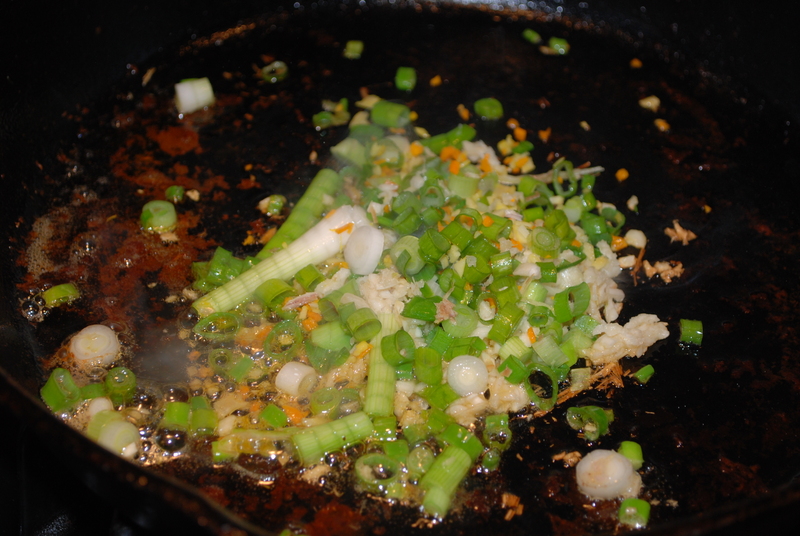 Reduce heat to medium and add the scallions, garlic, ginger, turmeric and lemongrass to the “shrimpy” coconut oil and stir to sauté for a couple minutes. 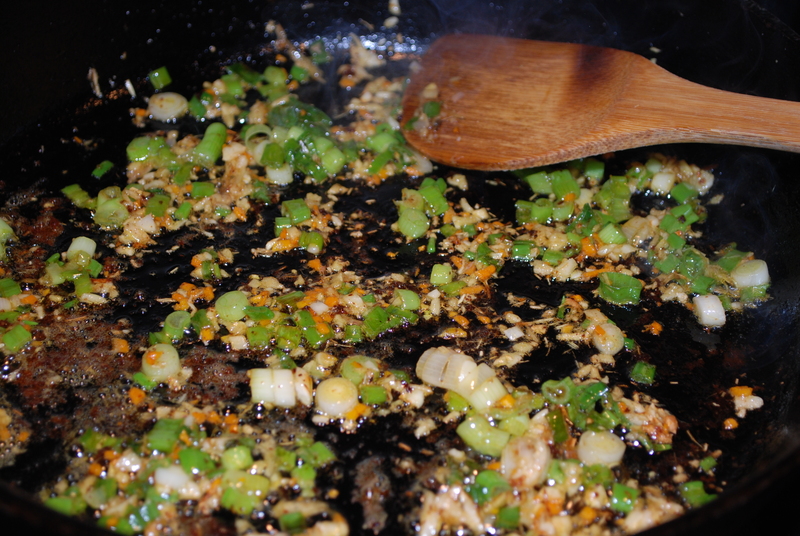 Add the lime juice, stir and continue to sauté and additional minute. Turn off heat, add the cilantro and stir to combine. 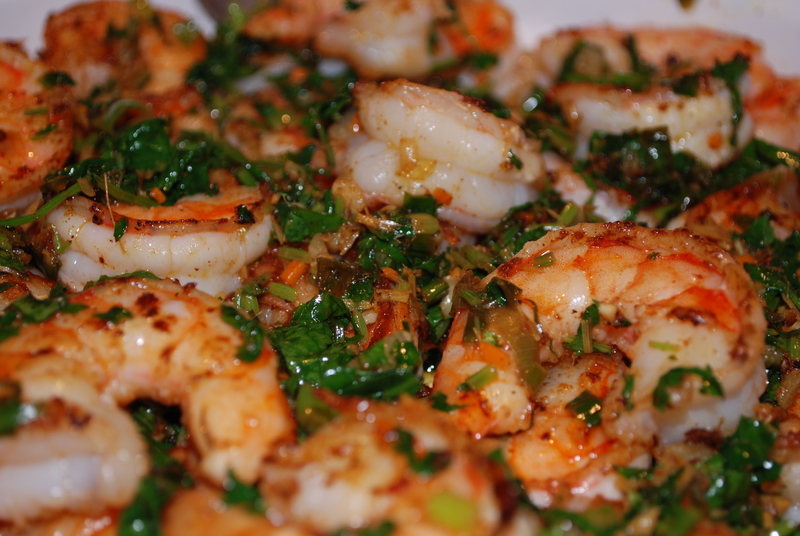 Scrape the sautéed fresh herbs onto the shrimp and toss lightly and serve immediately. I found that the rice was done just as I completed the rest of dinner. A quick and easy to prepare meal. 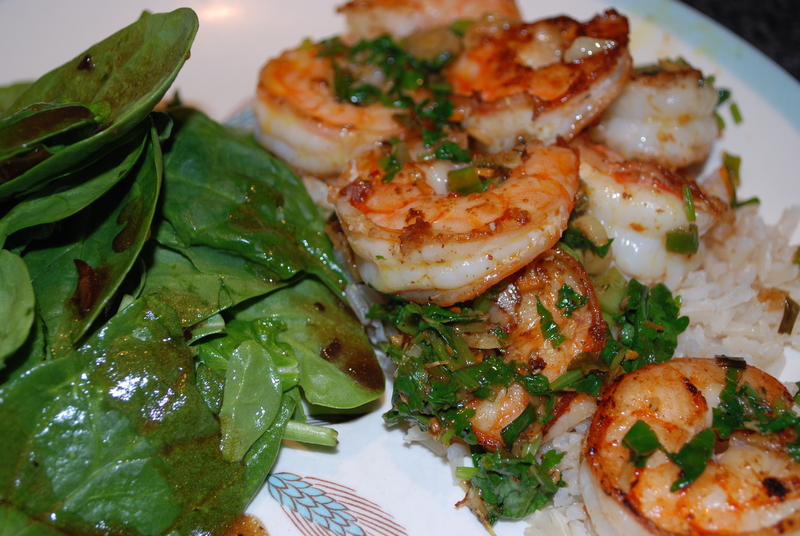 This entry was posted in in the kitchen and tagged cilantro, coconut oil, easy, fresh ginger, fresh turmeric, garlic, juice, lemongrass, lime, no salt, prepare, quick, recipe, scallions, seared, shrimp on April 10, 2014 by lenapietri. In a large soup pot saute onion and celery with olive oil over medium heat until tender and onion becomes slightly translucent. Add The herbs and spices, garlic, tomato paste and wine then allow to simmer for 5 minutes. Add tomatoes, shrimp broth, red pepper flakes and potatoes. Bring to a boil, reduce heat and simmer with lid on for 20-30 minutes until the potatoes are tender. 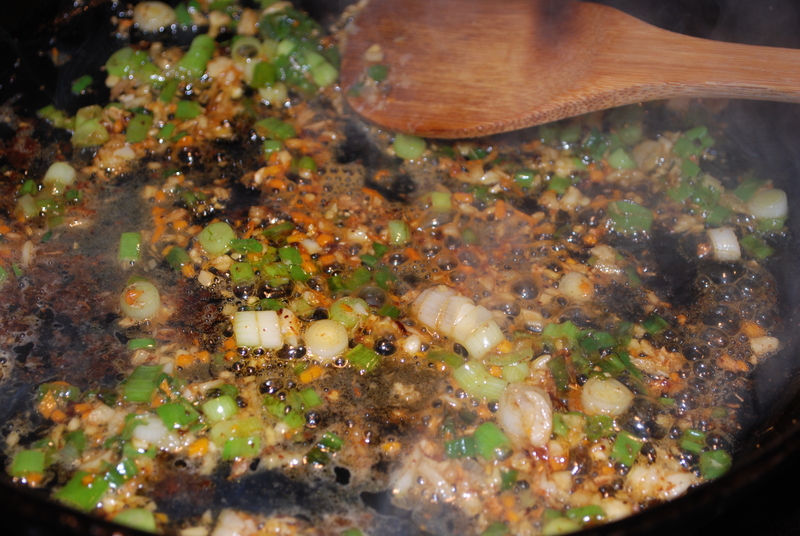 Add the fish and seafood, return to a boil, reduce heat and simmer for 10 minutes. Salt to taste. I served this with fresh bread, cheese, quince paste and an arugula salad with a lovely wine. This entry was posted in in the kitchen, Uncategorized and tagged Bouillabaisse, easy, fish, Fish Stew, meal, pescatarian, pollock, quick, scallops, shrimp, stew, tuna on March 9, 2014 by lenapietri. Cook rice till tender (place rice, water and salt in a pot, bring to a boil, reduce heat and simmer about 20 minutes) and leave covered until the rest of the meal is ready to serve. 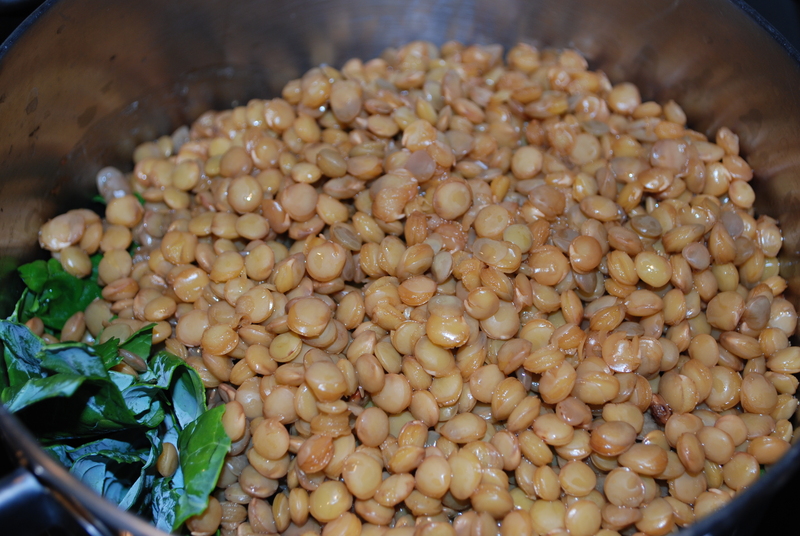 Cook lentils till tender (place lentils and water in a pot, bring to a boil, reduce heat and simmer about 20 minutes). Do not drain liquid. Preheat olive oil in a 3 quart sauce pan over medium heat. 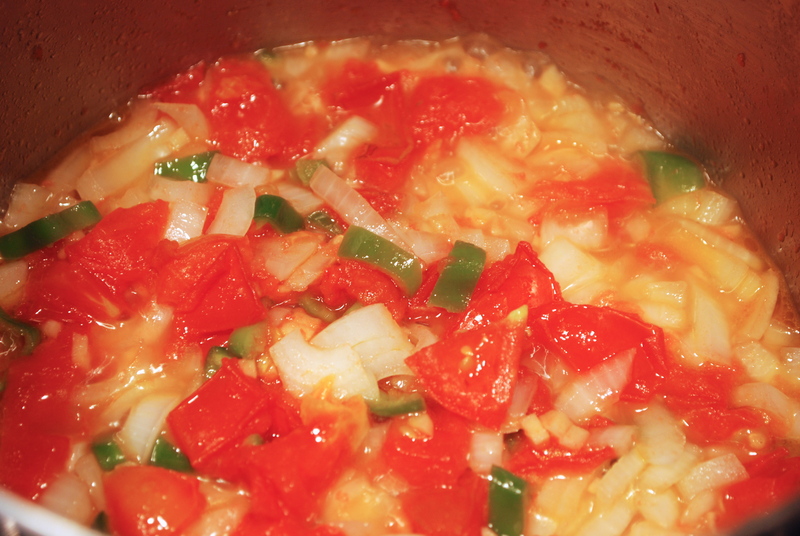 Add onion, pepper, tomato, ginger and salt, cover and simmer for 2 minutes (until the tomatoes break up and the other ingredients are tender. 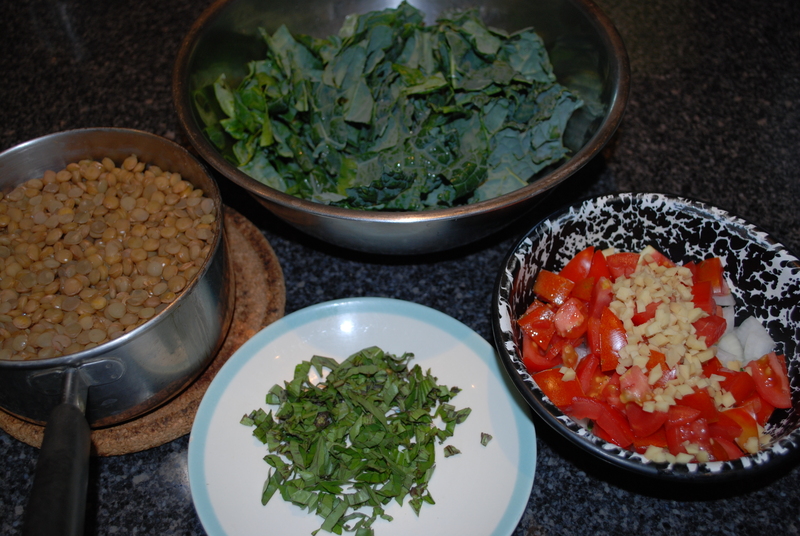 Add the kale, lentils with water and pepper and stir. Simmer 5-10 minutes. Remove from heat, add basil and stir. Serve over brown rice. In a small bowl combine the carrot, basil, vinegar, olive oil and salt. Arrange lettuce on the edge of a plate. 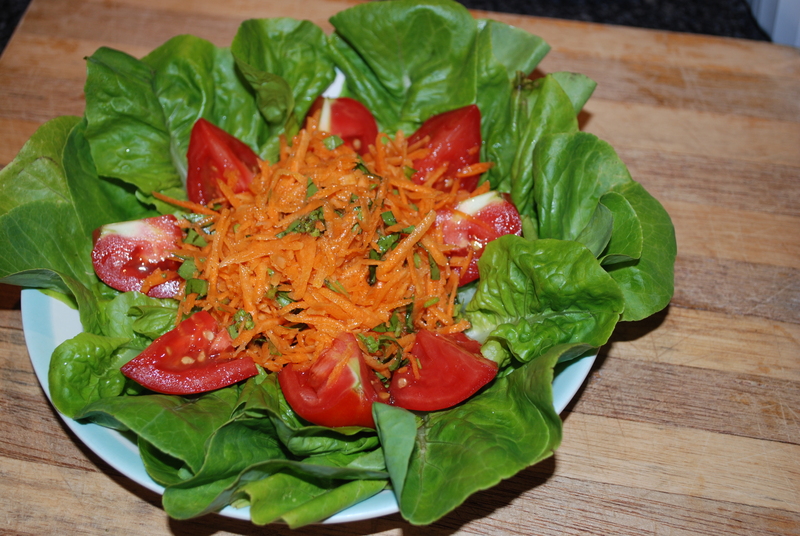 Place tomatoes on the ends of the lettuce leaves. Place the carrot salad in the center. 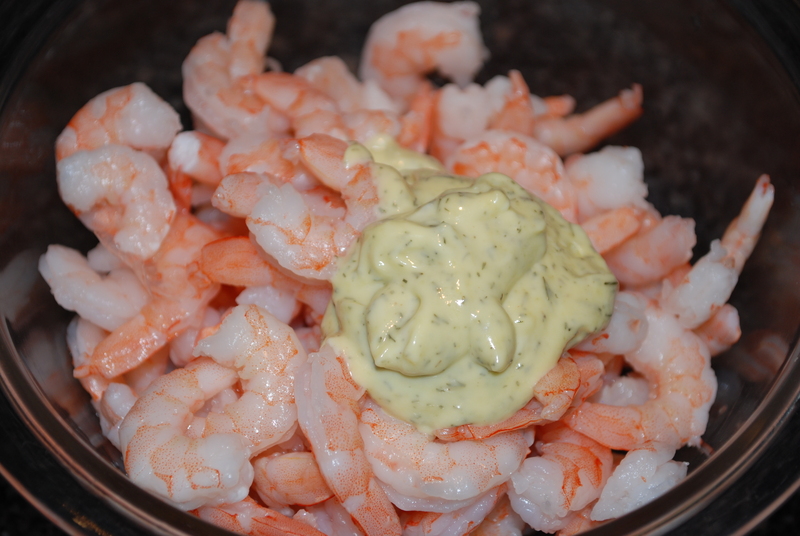 Combine all ingredients except the shrimp to make the dressing. Toss the dressing with the shrimp. Store in refrigerator until ready to eat. 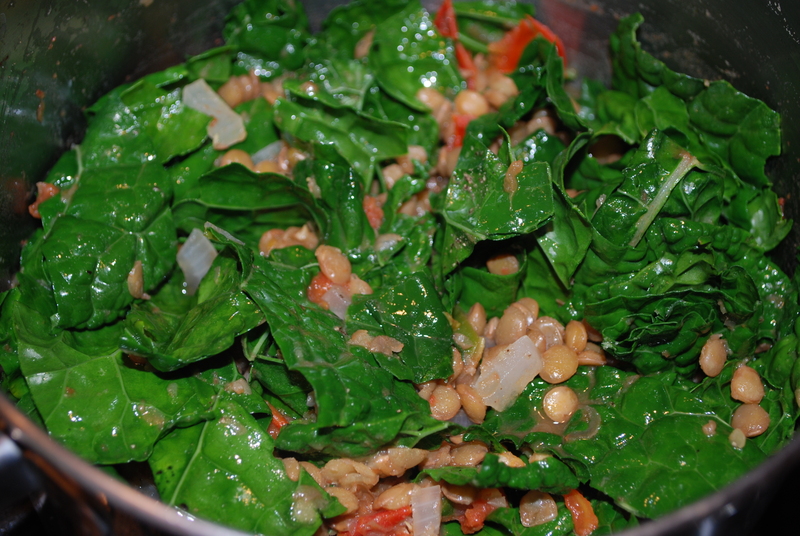 This entry was posted in in the kitchen and tagged brown rice, california olive ranch, carrots, curry, ginger, kale, lemon basil, lentils, licorice basil, salad, shrimp, stew, vegetarian on August 11, 2013 by lenapietri. A meal in honor of the latest trip to the local farmers’ market. All organic and locally grown. Toss shrimp with marinara sauce. Set aside in the refrigerator. When putting on the pot of water for the corn, preheat oven to 375. When the corn goes into the pot to cook, turn the oven off and turn the broiler on. 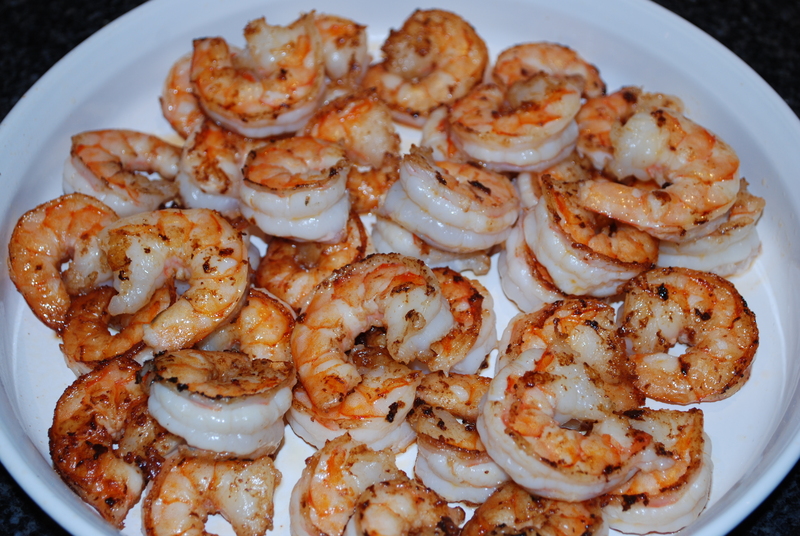 Place the shrimp under the broiler for 10 minutes. 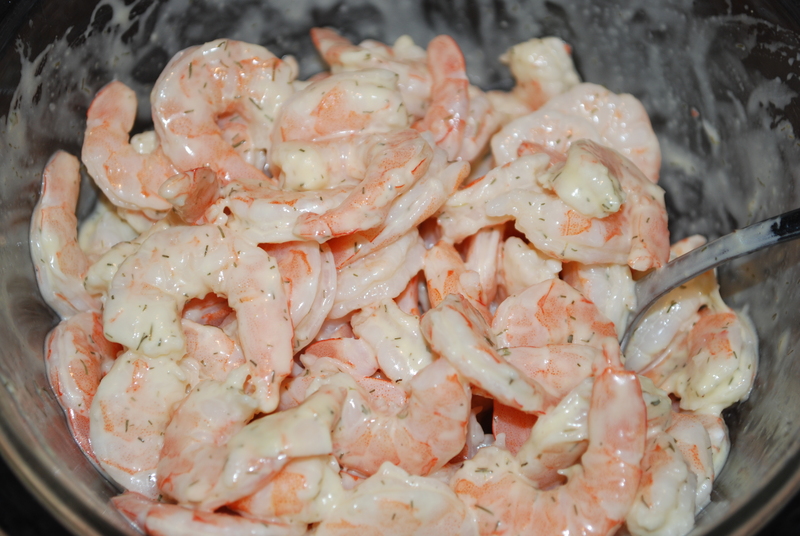 (Check the shrimp after 6 minutes so they do not overcook; they should just begin to brown and crisp). Sprinkle with salt and pepper. Tear the kale into slightly larger than bite size pieces, place in a bowl and massage (this breaks up the cellulose and makes the kale sweeter) by scrunching in your hands. Add the shredded carrot. In a small bowl combine the remaining ingredients and mix well. Add the creamy herb sauce to the kale and carrots and toss until well coated. Store in refrigerator until ready to serve. Put a large pot of water (filled to 1/3) on to boil. In the meantime shuck (remove husk, silk and break off the stem end and cut away any damaged corn) the corn. When the water is boiling (remember to put the shrimp under the broiler at this time) put the corn into the water, sprinkle with 1/4-1/2 teaspoon salt, cover and boil for 5 minutes. Remove corn immediately. 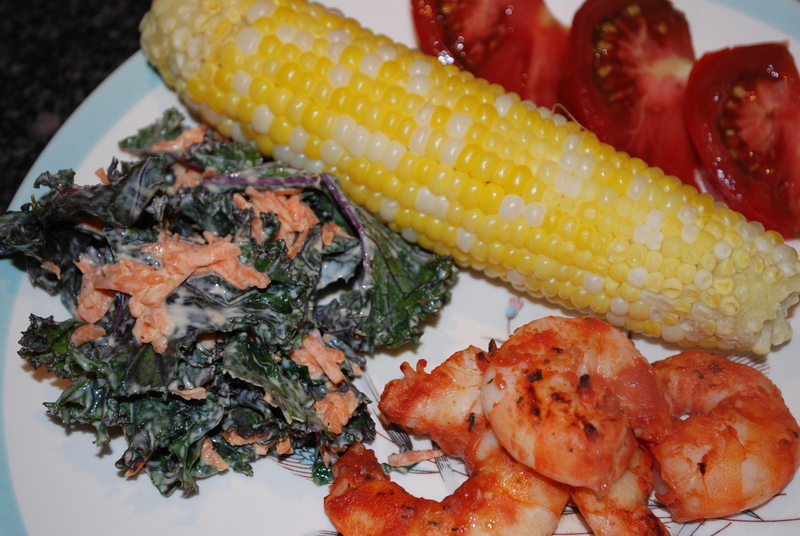 This entry was posted in in the kitchen and tagged broil, carrots, corn, corn on the cob, creamy dressing, heirloom tomatoes, kale, local, locally grown, marinara, organic, shrimp on August 4, 2013 by lenapietri. For this simple and hearty salad I used salad greens, yellow squash, potatoes, beats and shrimp. Feel free to pile the salad high with whatever is seasonal and to your taste. Scrub potatoes under running water, place in a pot, cover with water and sprinkle with salt. Bring to a boil, reduce heat to simmer and cook for 20 minutes till tender. Drain, fill pot with cold water and drain several times and allow to cool. Cut the potatoes into bite size pieces and set aside. Trim root and greens from beets (but save the greens in a large glass or vase for another meal) and scrub well under running water. Place in a pot, cover with water and sprinkle with salt. Bring to a boil, reduce heat to simmer and cook for 20 minutes till tender. Drain, fill pot with cold water and drain several times and allow to cool.Peel the beats. The easiest way to do this is by simply rubbing the skin layer off of the cooled beats. The skins should just slide off. Dice beats and set aside. While the potatoes and beats are simmering- Rinse and pat the salad greens dry, cut them into bite size pieces and place them on a platter. Rinse and cut the summer squash into bite size pieces then arrange them on top of the greens. If you like fresh onion, mince and sprinkle on top of the salad. While the potatoes and beats are cooling- peal and rinse the shrimp, place on a lightly oiled broiler pan then flip them (this is an easy way to coat each one with oil) and sprinkle with salt and pepper. If you are serving the shrimp cold you can broil them immediately but if you want them warm refrigerate until 10 minutes before you are ready to serve the meal. 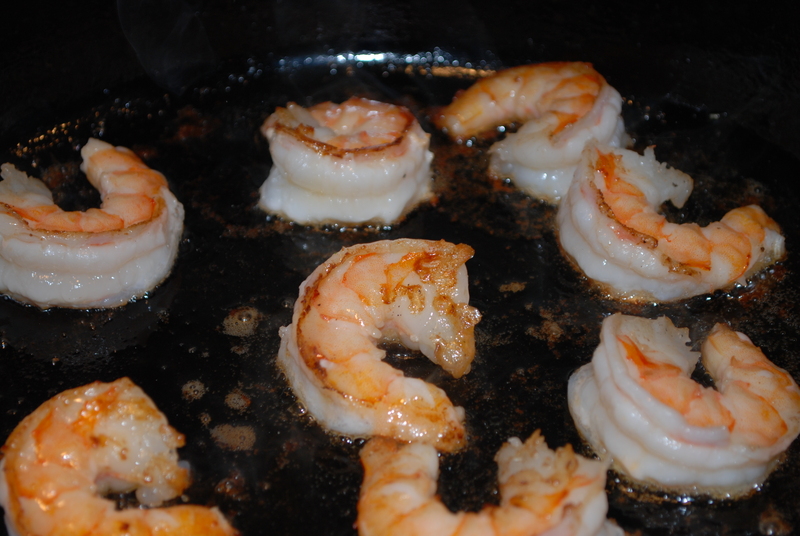 Turn on the broiler and place the shrimp under the broiler until done, about 10 minutes, depending on the size. Prepare the Mojo Sauce- Mix together 1 cup extra virgin olive oil, 6-10 cloves garlic; crushed, 1/4 cup lemon (and/or lime) juice and 1/2 teaspoon salt. Set aside. Mound the cut potatoes on top of the already started salad, top with the diced beats and arrange the shrimp on the top of the salad platter. The Mojo Sauce can be drizzled on top or served on the side. We serve it on the side because some of us just like a little drizzle and others really pour it on and finish the plate with a piece of bread to soak up all of the delicious sauce. 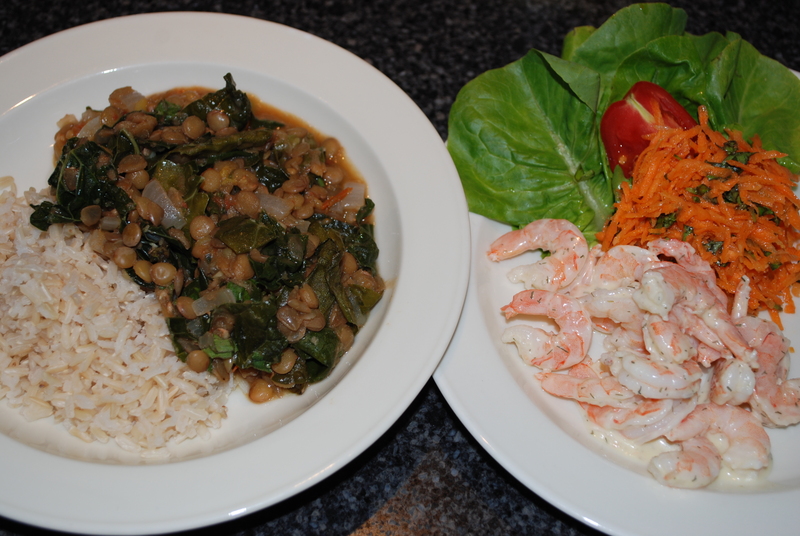 This entry was posted in in the kitchen and tagged beats, mojo sauce, mojo saude, salad, seasonal salad, shrimp, summer salad on June 29, 2013 by lenapietri.